I must apologize for not posting much these days-- I'm trying very hard to finish up some experiments, to find the time to review and cook from some new books I've received and want to do justice to, but I have some writing to finish, as well as my job and all else that life entails, so it's slow going! In the meantime, here are pics of a couple of experiments I've been working on, plus a dinner I made the other night from what we had around-- a sort of lasagne casserole. It turned out quite well, but the frittatas were thinner and less substantial than my tofu version. They were tasty, though, and not slimy-- good hot or cold. The Vegg does add more of an egg-y flavor. 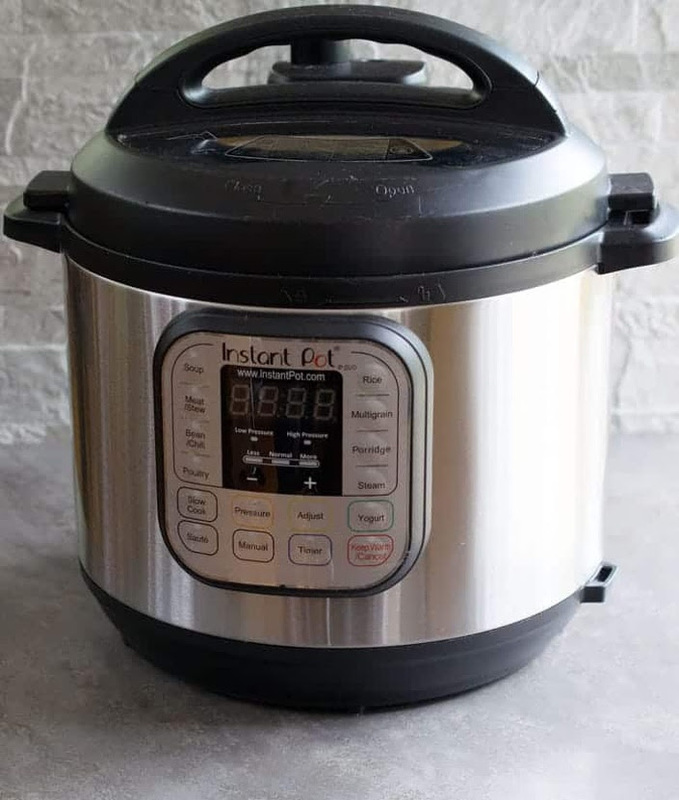 However, I want to try it again with maybe 2/3 tofu and 1/3 Vegg and see if I like that better-- will report back, with more details, when I'm satisfied. As for that "something from nothing", I always feel good when I can use up food that might get thrown out if I don't think of some way to use it. No Impact Man writes that "...food leftovers are the single largest component of the waste stream by weight in the United States. Americans throw away more than 25 percent of the food we prepare. We throw away 96 billion pounds of food a year." And, besides being wasteful in this economically-stressful time, that adds to greenhouse gas emissions." Meanwhile, food leftovers are the single largest component of the waste stream by weight in the United States. Americans throw away more than 25 percent of the food we prepare. We throw away 96 billion pounds of food a year. The most important method of reducing food-scrap associated greenhouse gases, therefore, is to waste less food (see the diagram above for the EPA’s food waste recovery hierarchy). Here in No Impact land, we waste less food by cooking less, saving leftovers for later, and eating food before it goes bad (not particularly complicated or high tech). Scraps and rinds go to the worms." James McWilliams explains why we should care more about food waste in this article. Anyway, the "lasagne casserole" I made from leftovers was pretty good-- I think I'd add more mushrooms and more pesto next time, but it was quick and easy and used up various things that I had around...like a bit of DH's delicious spaghetti sauce. To which I added a little red wine from an open bottle in the fridge, some leftover juice from canned tomatoes, and 1/2 a package of Yves veggie Ground Round (hamburger substitute). I ended up with about 2 cups of sauce. I put about 2/3 cup of the medium-firm tofu aside. I squeezed the frozen silken tofu until it was fairly dry and crumbly, and placed that in a bowl. I mashed in the remaining medium-firm tofu and added a bit of salt. I used an immersion blender to whip the 2/3 cup tofu with a couple of teaspoons lemon juice and a pinch of sugar. Then I folded that into the other tofu mixture in the bowl. It tasted quite nice and had a very "cottage cheese-y" texture. Next, I sauteed some sliced cremini mushrooms that needed using-up, and then added some vegan pesto (only 1 tablespoon-- should have used more). Baked in the oven for 30 minutes, it was nothing to be ashamed of, and provided a tasty, thrifty, nutritious lunch entree for each of us on our next workdays! About that second experiment, I'll be announcing the recipe (which will go up on vegan.com) as soon as I get do a few adjustments and get some photos done, but I've been working on a second version of my vegan palm oil-free buttery spread, Buttah, a softer "tub" version. UPDATE: April 2017....Check out my new, easier, cheaper Vegan Palm Oil-Free Butter-y Spread. It's a softer spread but can be frozen and evne used in its frozen state. People are paying attention to Buttah! 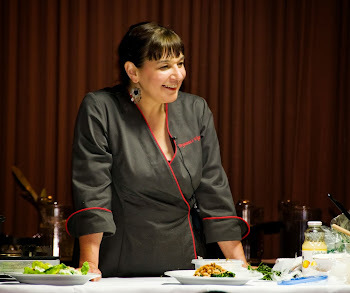 I am so thrilled that Aaron Adams, chef at Portobello Vegan Trattoria in Portland, OR, wrote to me: "Bryanna! We're working on perfecting production of your buttah for our restaurant...once we're up and running on it, we're done with EB and the other palm oil stuffola. Thanks for your hard work and dedication. It makes a huge difference." OMG! AND, again in Portland, Grant Butler, writer for The Oregonian, included my palm oil-free vegan butter in his list of "hot topics" this week! 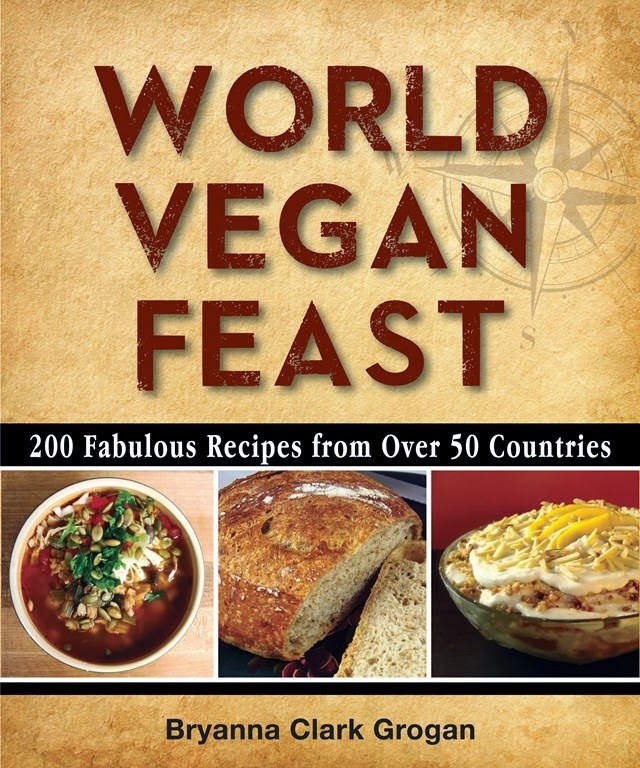 The interest has exceeded my expectations, and we've had just about 5000 page hits on the recipe page at vegan.com! All of this makes me feel that the project was very worthwhile and I hope that it will not only give vegans and others an option to make a useful and delicious palm oil-free alternative to butter, low in saturated fat, in their own homes, but that vegan margarine producers will endeavor to change their formulas to exclude palm oil. I've used buttah successfully also in scones, biscuits and pie dough, and I'm very happy with the taste and performance. Rye crisp, raw veggies and dark Dutch pumpernickel bread with my hummous and a new smoked tofu spread that I developed for Alive magazine. 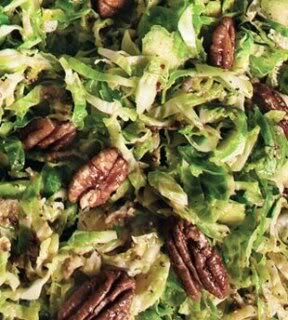 Delicious Brussels Sprout Slaw with mustard dressing and candied pecans, recipe here. 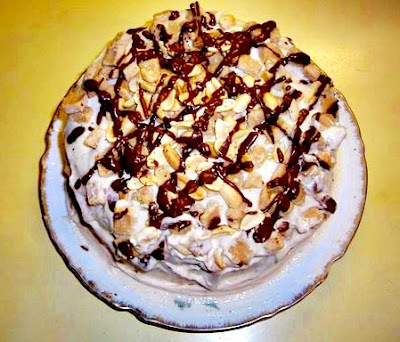 I have to admit that I did not come up with the idea for this recipe all on my own-- I got the idea from the March 05 of Bon Appétit magazine in an article by Emily Luchetti, pastry chef at the Farallon restaurant in San Francisco (my old stomping grounds). 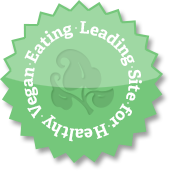 Since chocolate and peanut butter are two of my favorite things (especially together), I just had to veganize it for my now-defunct newsletter... which meant pretty much starting from scratch. It turned out to be everything I imagined, but it's very rich-- much richer than the cakes I normally make, so cut small slices and save for very special occasions, like Easter. (Or eat it on a day when you only have low-fat soup and salad.) I think it's worth every luscious calorie! BTW, I can't find vegan peanut butter chips anywhere, but it's easy to make your own for this recipe-- recipe below. For some reason, the cake benefits from being made a day ahead of time. The first day the cake layers seem a bit dry, but they moisten up after a night in the refrigerator. NOTE: Stir the whole wheat pastry flour well before measuring and use the "scoop and level" method. You can sift the unbleached flour before measuring. 1 Preheat the oven to 350 degrees F. Grease and flour three 8" round cake pans and line them with baking parchment cut to fit. 2 TO MAKE THE CAKE LAYERS: Cream together the 1/2 cup peanut butter and margarine, using an electric hand mixer, a stand mixer or a food processor. When smooth, add the 1 cup brown sugar and light organic unbleached sugar and beat well again. Add the tofu, egg replacer and vanilla and beat again until very smooth. 3 If using a food processor, scoop the mixture into a mixing bowl. 4 Mix the flours, baking powder and salt well with a whisk in a smaller mixing bowl. 5 Add the flour mixture to the creamed mixture alternately with the soy milk, starting and ending with the flour mixture, and beating just enough so that you don't see the flour or milk anymore between additions. 6 Pour the batter evenly between the prepared pans and smooth the tops. Bake for 25 minutes. Cool on racks for 10 minutes, then remove from pans to racks, removing the cooking parchment. Cool thoroughly before icing. Wrap well in plastic wrap and ice the next day. 7 THE MORNING OF THE DAY YOU ARE TO SERVE THE CAKE, make the Chocolate Ganache. Set aside 1/4 of a cup to drizzle on top of the cake. Beat the 1/4 c. of peanut butter and 3 T. brown sugar into the remaining ganache. Refrigerate until firm. 8 Make the basic Fluffy White Frosting and refrigerate for several hours before icing the cake. 9 WHEN READY TO ICE THE CAKE, spread half of the peanut butter-ganache over one layer (top side down). Top with another cake layer (top side down) and spread with the remaining peanut-butter ganache. Top with the last cake layer (top side up). Frost the cake with the Fluffy White Icing. 10 Crumble the Peanut Butter Chunks over the top of the cake and sprinkle with the peanuts. Heat up the 1/4 c. of ganache that you held back (I do it in the microwave at 50 percent power for about 30 seconds). Drizzle it from a spoon over the topping. Refrigerate the cake until ready to serve. Yield: 1 1/2 cups Recipe from my book Soyfoods Cooking for a Positive Menopause. A ganache is a rich, fudgey chocolate icing that firms up when cooled. It is usually made with heavy cream, but rich, full-fat soymilk blended with silken tofu makes a wonderful substitute. A firm ganache is also the basis for making chocolate truffles-- if you would like to try this, reduce the amount of milk to 1/3 to 1/4 cup. NOTE: Remember that the quality of your ganache depends upon the quality of the chocolate you use. 1 Break the chocolate up and process it finely in a dry food processor. Leave the chocolate in the processor. 3 With the motor running, pour the hot soy crème in through the food processor feed tube. Process until the mixture is smooth. Refrigerate until firm. Enough for a 2 layer/ 8" cake or a 9x13" sheet cake. I like this icing because it's not too sweet. 1 Whisk the milk into flour in small saucepan until smooth. Heat and stir until it boils and thickens. Cool thoroughly (place in a small bowl inside of a larger bowl of cold water). 2 With an electric hand mixer or stand mixer beat the butter, sugar, vanilla and salt until light and fluffy-- several minutes. Beat in the cooled flour paste and beat until smooth and fluffy. Chill thoroughly before frosting. Frost the cooled cake. Keep the frosted cake refrigerated until serving time. Easy and quick to make, and firm enough to cut into tiny squares and use in baking. They hold their shape during baking. Taste yummy, too! NOTE: If you use the creamed coconut option, the easiest way to melt it without burning is to microwave at 30% power for 30-60 seconds. Mix A ingredients with a whisk in the top of a double boiler over simmering water. Stir until the sugar is dissolved. Off the heat, stir in the melted cocoa butter, then the milk or protein powder and, finally, the peanut butter. Mix until smooth. Pat out onto a 7 x11" baking pan lined with baking parchment cut to fit.. Refrigerate. When firm, remove from pan and cut into tiny squares. Keep refrigerated in a covered container (or freeze) until you use them. 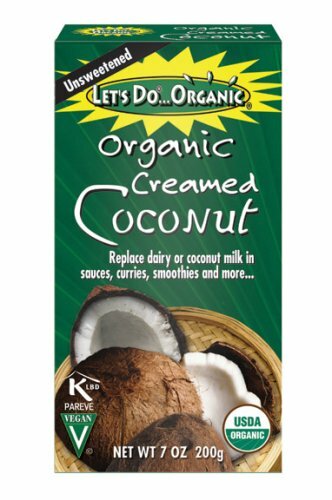 **CREAMED COCONUT-- WHAT IS IT? You can buy other brands of this product in Asian, Thai, Caribbean (Grace brand), and Indian markets and in the Asian section of some large supermarkets. There are different brands, but they all look similar and are of similar size. Sometimes it is refrigerated, sometimes not; sometimes it is even frozen, though it does not need to be. It keeps just fine un-refrigerated. It can be stirred directly into sauces to thicken them or mixed with hot water to make coconut milk or cream. It will thicken up whipped toppings and icings, too. It is high in fat, but a little goes a long way in terms of flavor and I think it has a fresher taste than canned coconut milk.